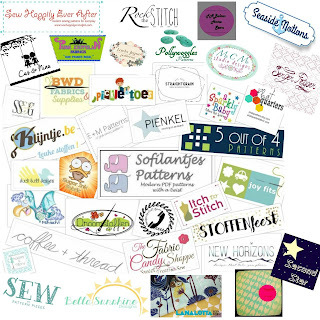 Happy 2nd Anniversary, Sofilantjes Patterns! So, we decided to do something a little different, this summer... we decided to get get season passes to Carowinds! 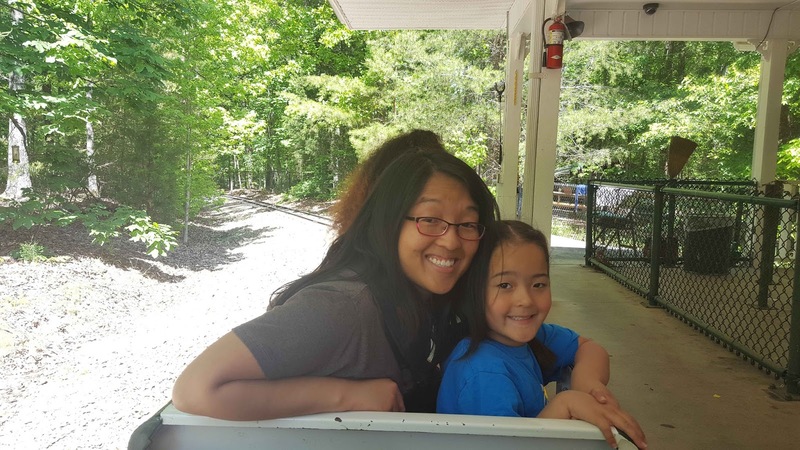 It only took us almost ten years of living in NC to finally visit the Carolina theme park! We spent most of the day in Planet Snoopy and Lil' Miss had a blast!! We got to ride lots of rides and the lines were not as long as I had anticipated (being Memorial Day, and all). Katy is already talking about, "...the next time we go...!" I guess you can officially call us "Southern." Hehehe..! Hello and welcome to my stop on the Sofilantjes Patterns 2yr Anniversary Blog Tour. 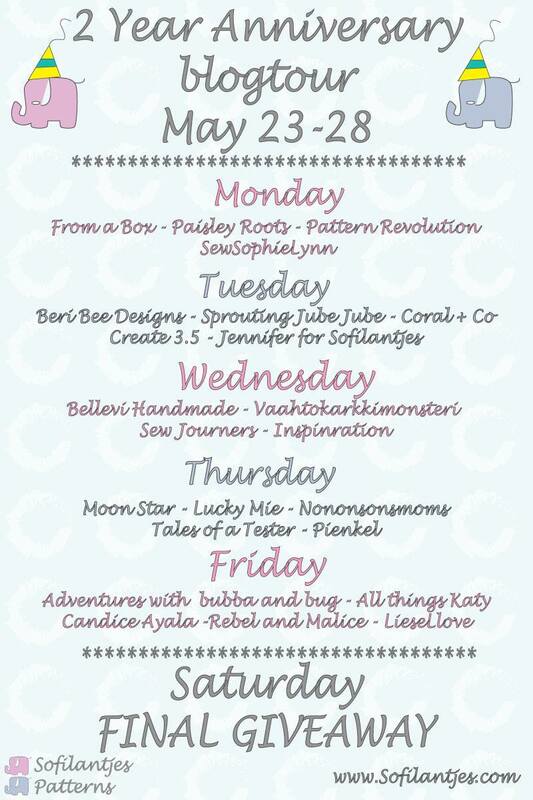 You may remember that I participated in Sofilantjes Patterns First Anniversary Blog Tour, almost exactly a year ago. I am just as excited to celebrate another year of fun, new patterns with Sofilantjes Patterns! Happy Second Anniversary, Sofilantjes Patterns! 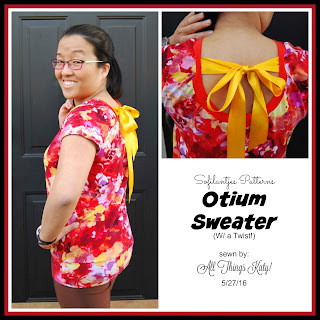 Today, I'm going to show you a quick, simple and fun modification to the already-awesome Sofilantjes Patterns Otium Sweater- a ribbon tie back! The first thing I did was sew up the Sofilantjes Patterns Otium Sweater as instructed up to step four. Next, I cut out two pieces of ribbon, 24" long, each. I angled one edge on each length and heat sealed the edges of the ribbons. Then, using the pattern-provided markings for the top of the bow, I sewed in the ribbons- one on each side. After donning the shirt, I then tied the ribbons into a bow (this, was probably the hardest step as I ended up tying the bow, blind and hubs isn't so handy when it comes to the perfect bow- ha!). Sofilantjes Patterns Otium Sweater- Ta-da! See, wasn't that simple?! A quick, fun and simple modification for the Sofilantjes Patterns Otium Sweater! Now, no celebration would be complete without some sort of giveaway!! Check out the fun giveaways and prizes, below! And, for more inspiration, please go and check out these other fabulous bloggers and their takes on other Sofilantjes Patterns! Happy Second Anniversary, Sofilantjes Patterns! Cheers to many more! Today, I get to share something fun with you- a PDF sewing pattern for leggings and socks (really- socks!) from a new-to-me designer, The Wolf and the Tree. 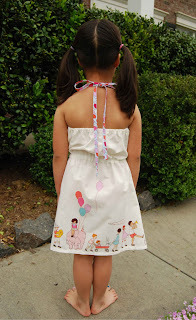 "-A PDF sewing pattern with instructions that include photos and illustrations. -Footed tights, leggings, capris, biker shorts, shortie shorts. -Yoga waistband and cuff bands. -4 rise options (including maternity). -2 way and 4 way pattern. -Material requires only 30% stretch. -The size chart is given in metric and imperial measurements." 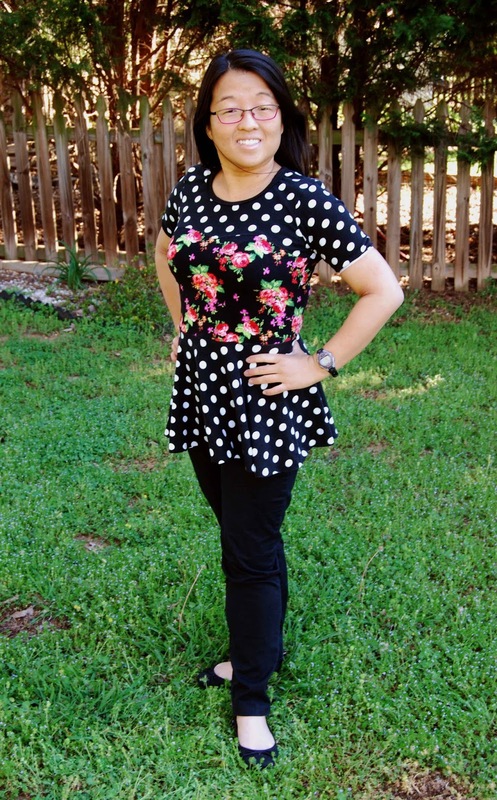 I sewed up a size 10 waist graded to size 2 hips, petite inseam leggings. I used swim knit that I had in my stash. I did the yoga waistband option with medium rise. With the help of the pattern's instructions, I was able to get a pretty good fit. Next time, I may lower the front and back rise (I felt like the leggings came up a bit high on my belly). I love that you "hem" the leggings with bands (ie, no folding and hemming). I did add 3/4" elastic (cut the to the same width as the yoga waistband) to the waist- it just helps the leggings stay up while I move. Another thing that I really appreciate about the The Wolf and the Tree Gazelle Leggings pattern is the fact that it comes with a petite inseam. The petite inseam was PERFECT for my 5'-0" height. The leggings weren't too long and they fit well over my large calves. The main thing that intrigued me about this pattern is the fact that it allows me to sew my own footed tights. (For the sake of this blog tour, I was asked to sew up the leggings). How fun is that?! Stretch lace, here I come! -Women's Sizes 0-32W, Men's Shoe Sizes 8-17 "
I sewed up a size 4 mini crew sock using scraps of 4-way cotton lycra from my stash. Sizes are broken down pretty incrementally and I love that- it allows for a great, tailored fit. *Caution- don't go by your normal shoe size- take the time to read the pattern and actually measure your foot. *Seriously- this pattern took longer to print and cut than it did to sew! 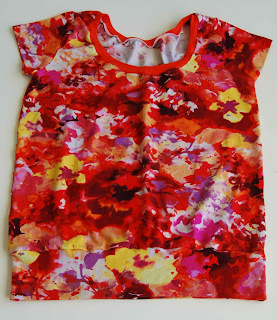 So fast- I love a quick sew!! I sewed up a size 5t mini crew sock using scraps of 4-way cotton lycra from my stash. Once again, this was a super fast sew! Next time, I'll do the bobby sock version because Lil' Miss loves her lace-trimmed socks (just like Fancy Nancy;). I chose to sew up these patterns because I never thought about being able to sew up my own socks and/or tights. I love a good challenge and learning something new. I would consider all of the patterns that I reviewed above beginner friendly. 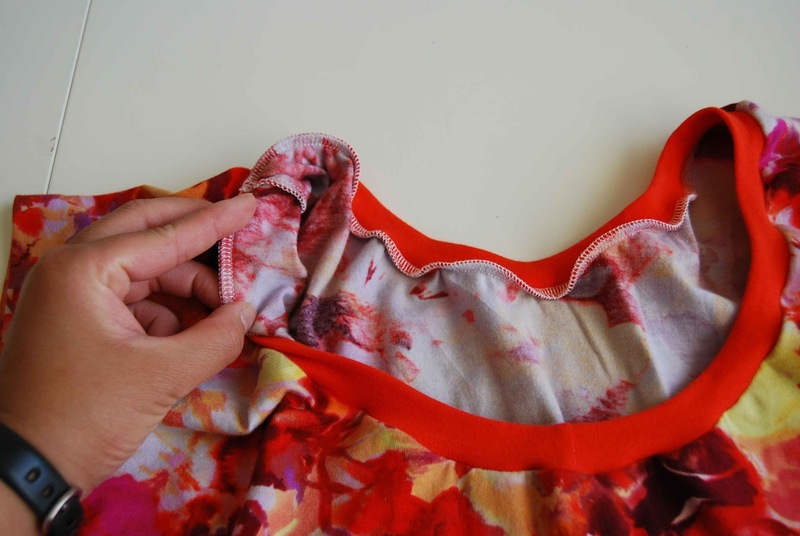 All of the patterns are VERY detailed and contain a lot of instructions on how to get the perfect fit. It may seem wordy at first, but if you actually read it and follow along, you'll get a made-for-you fit. You can get your own copy of the patterns HERE or HERE. You can use the code 'YellowRibbon' to save 25% through Friday May 27. 2016. 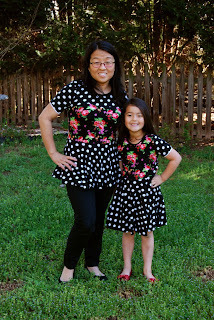 Be sure to check out the other blogs this week for as no two have sewn the same item! Hello, Summer!! We are ready for you!! 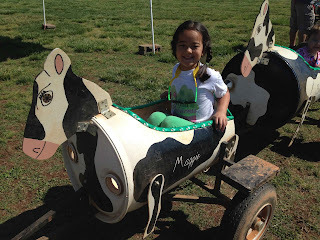 After our first full year of Kindergarten, our Lil' Miss is ready for summer break! 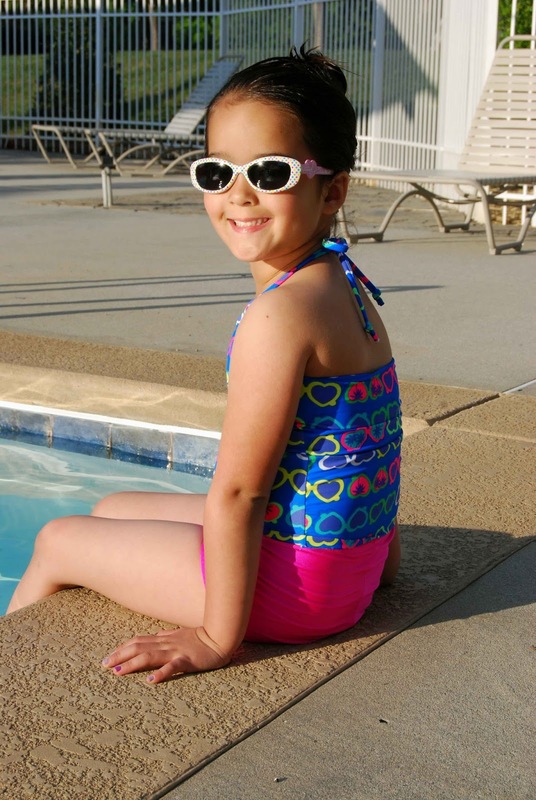 Summer camps, ballet recitals and fun in the sun.... especially pool time!! Once again, I wanted to sew up a bathing suit for Lil' Miss (and her doll- and fourth family member- Samantha ;-). 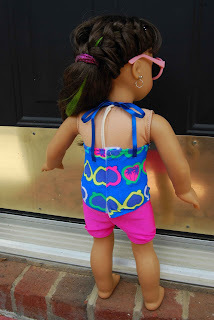 So, when Cole's Corner and Creations put out a tester call to test their newest bathing suit, the Surfside Tankini and matching dolly bathing suit, I dove right in (pun intended- hahahaha!). 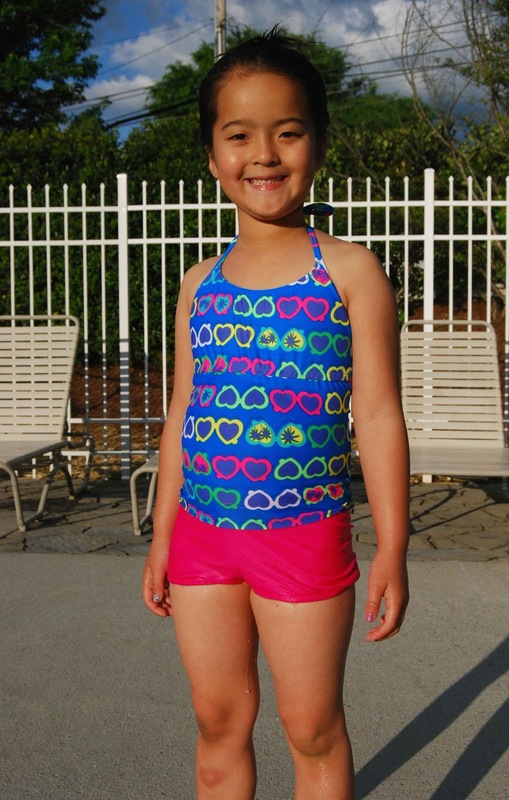 The Cole's Corner and Creations Surfside Tankini is a modest two piece tankini featuring a halter style top and boy shorts bottom.Top front and boy shorts are lined for extra coverage. Cole's Corner and Creations Surfside Tankini- Pool Side! -The Cole's Corner and Creations Surfside Tankini is sized for 1/2-16. -The Cole's Corner and Creations Surfside Tankini PDF sewing pattern features layered, trimless pattern pieces. That means that you only print the size that you need/want AND there is less cutting involved- win! -The Cole's Corner and Creations Surfside Tankini PDF sewing pattern includes the following- a size chart, fabric requirements chart, and elastic cutting chart. 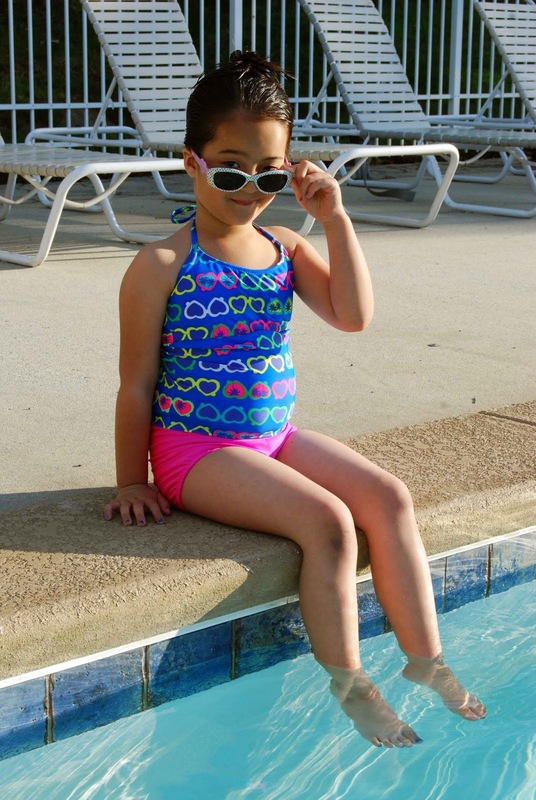 -The Cole's Corner and Creations Surfside Tankini features step-by-step photographs and written instructions for each step. 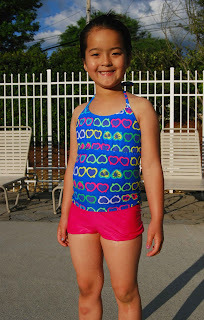 -The Cole's Corner and Creations Surfside Tankini PDF sewing pattern also includes pattern pieces and/or instructions for optional bows and flower. I sewed up a straight size six for Lil' Miss. 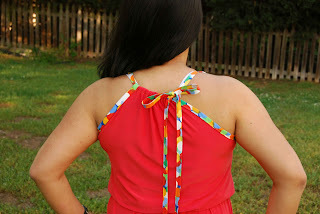 She was dying for a "neck tie" bathing suit (ie halter style), so I left the straps free to tie into a bow behind the neck (instructions in the tutorial also include options for crossed, straight, and/or permanent strap placement). To be honest the Cole's Corner and Creations Surfside Tankini sewed up pretty quickly. The boy shorts were simple and easy to accomplish. The part that took the longest to accomplish was sewing in all the swim elastic. 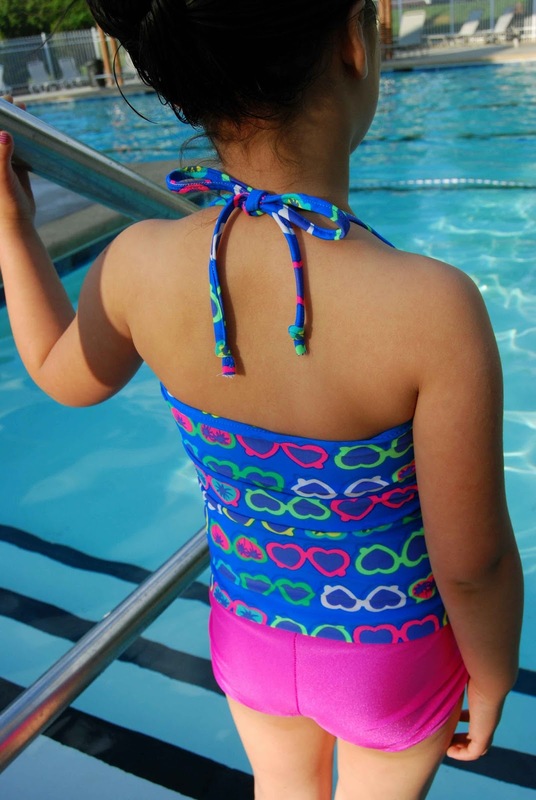 Trust me, though, elastic around the top bottom hem, neck, arms, straps, waist and leg opening are needed for an active swimmer (it keeps everything in place!). Do it once and you can definitely do it again! The top definitely "hugs" the chest and stays put- a great fit. 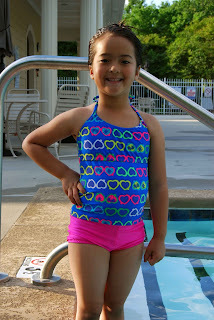 The boy shorts are not at all revealing or cut too high- perfect for little swimmers! Also, the two piece aspect of the Surfside Tankini make restroom breaks that much easier in a wet suit (only other moms will appreciate that feature!). Cole's Corner and Creations Surfside Tankini- Post Swim! Cole's Corner and Creations loves their matching dolly patterns!! 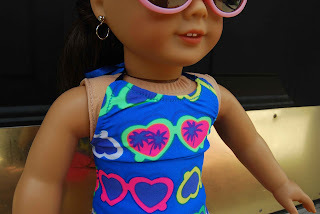 So, I just HAD to sew up a matching dolly Surfside Tankini, too! Samantha- Katy's non-swimming-don't-get-wet-American-Doll- looks darling and ready for the beach in her matching Surfside Tankini. 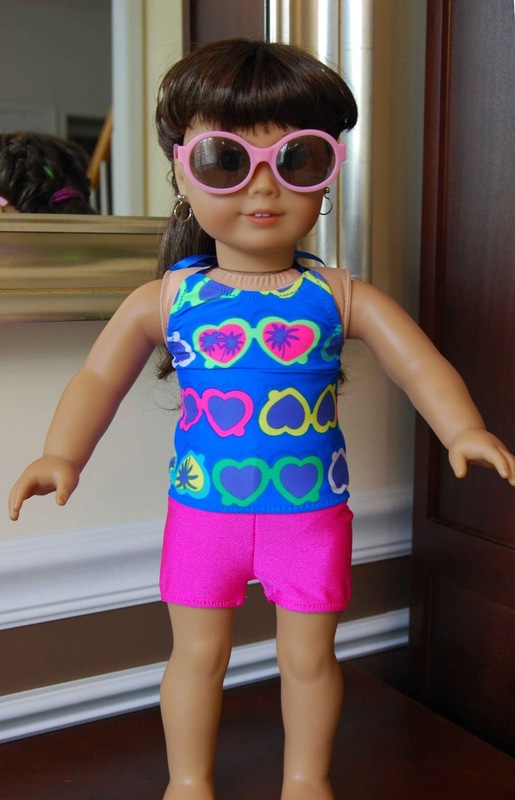 ;-) The Cole's Corner and Creations Surfside Tankini- DOLLY is sized for 15" and 18" dolls. 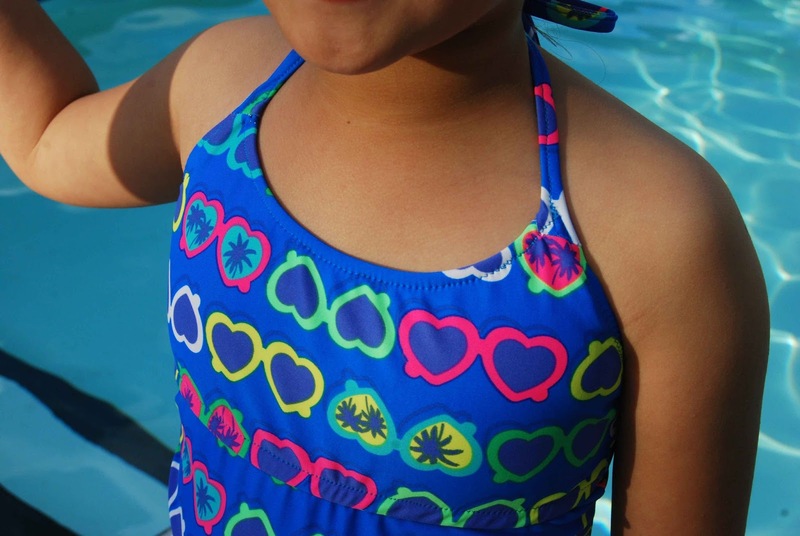 Now, go out and make a splash- sew up the Cole's Corner and Creations Surfside Tankini! Happy Mother's Day to all the mamas, mamas-to-be and the mamas of the heart, out there! Welcome to the last day of the Connected By a Thread Mother's Day Blog Tour. 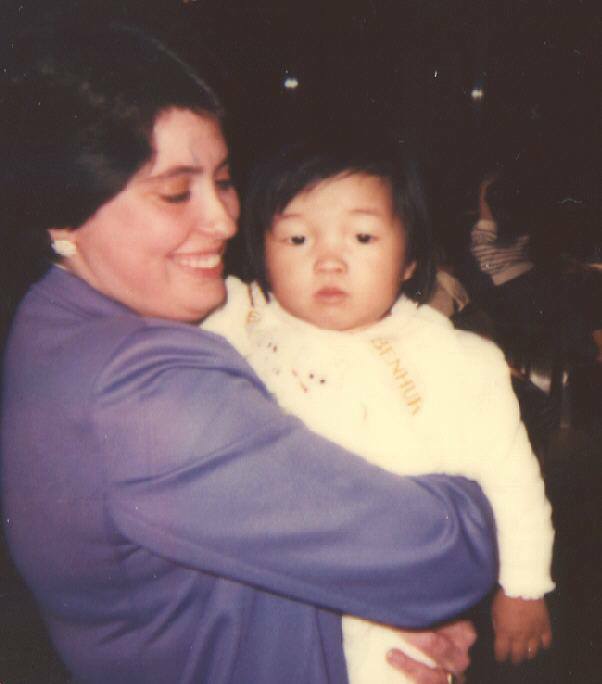 My mother and I on the day of my arrival in the US, May 6, 1983. I love my family and I can honestly say that we're pretty close. My parents were always very open about my adoption and it was never a taboo subject (thanks, Mom and Dad!). However, I grew up the minority in a mostly Caucasian world- nobody ever looked like me. 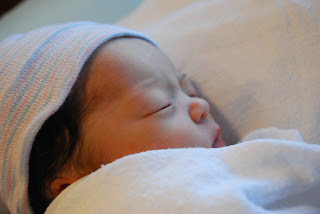 Fast forward to February 2010 and I became a mother. I became a mother to a perfect little girl... that LOOKED.JUST.LIKE.ME!!! Dark hair, almond eyes, petite nose. I cannot express how much that has meant to me- to have another person out there in the world that looked like me, that was a part of me! Happy Mother's Day to me! So, back to the task on hand- The Connected By a Thread Mother's Day Blog Tour...! For this blog tour, I sewed up the Patterns for Pirates Ladies Sweetheart Dress and girl's Me Hearties Dress. I love Mommy and Me outfits and, for the moment, so does Lil' Miss (I'm just going to go with that for as long as she allows! ;-). 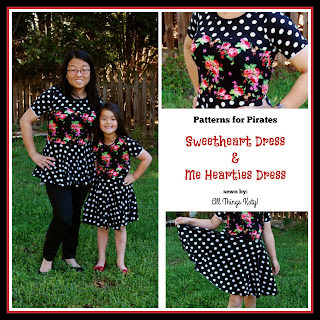 For the Patterns for Pirates Ladies Sweetheart Dress, I sewed ups a size medium bust (graded out to large in the waist) and back to the medium for hips peplum top. I also alter the pattern to accommodate my height (I'm 5'-0") by taking an inch off the bodice and half an inch from the skirt portion. I did short sleeves with lingerie elastic finish. The neckline was done with traditional knit neckband. 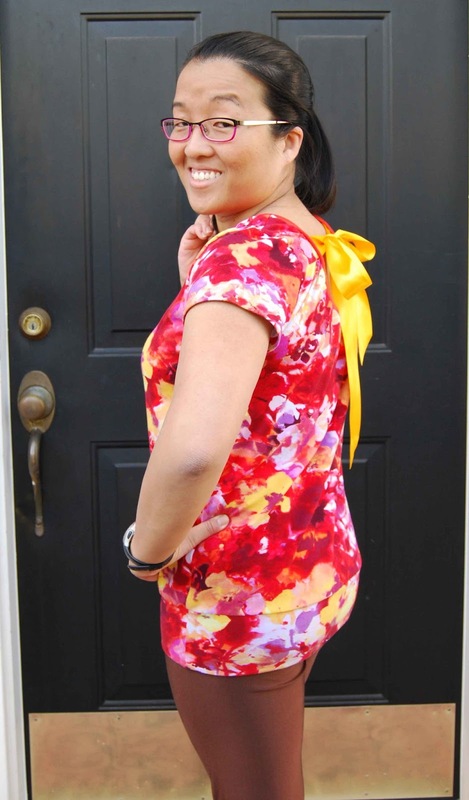 And, because this pattern's signature look is the sweetheart, I did the color blocked, sweetheart neckline. 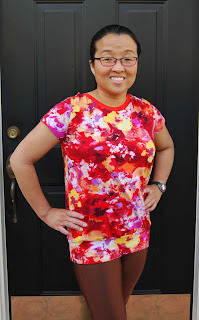 I have to admit that I had my initial doubts about the cut of this pattern- I wasn't sure it would be super flattering on my short, square frame. However, after sewing up a Sweetheart dress of my own, I was very pleased with the end results- the waist hit just right and the neckline wasn't too low, or too high. 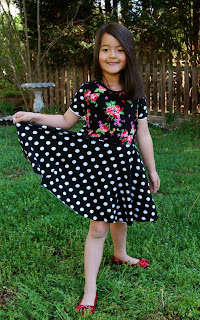 For the Patterns for Pirates Girl's Me Hearties Dress, I sewed up a straight size six dress. Lil' Miss' dress includes short sleeves finished with lingerie elastic and traditional knit neckband. I chose to do the regular, plain bodice (aka, not the sweetheart). 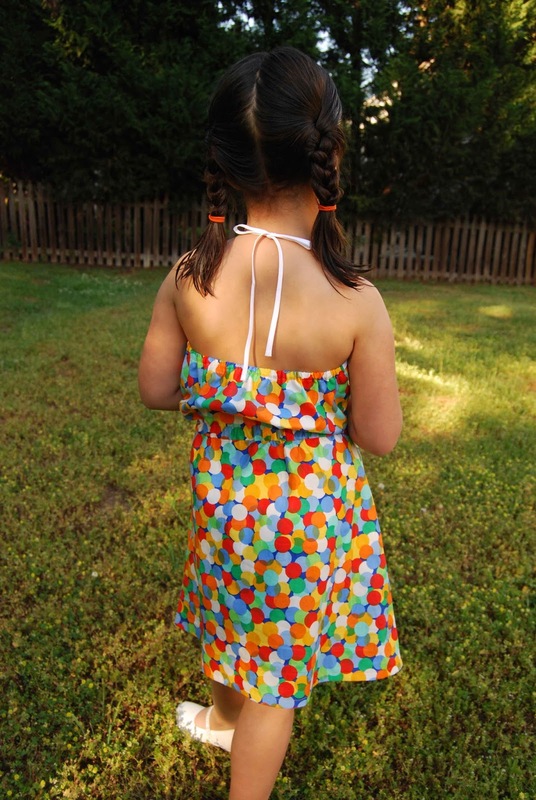 Fabric for both dresses were purchased online from Purpleseamstress Fabrics. Both patterns included multiple sleeve lengths and dress lengths. As shown by our outfits, you can either create the signature sweetheart neckline, or the plain bodice. I love the versatility of these patterns! You could literally make this pattern in long sleeve for the winter and sleeveless for the summer! Yay! Lil' Miss, on the other hand, just loves the twirl factor of the full circle skirt of the Patterns for Pirates girl's Me Hearties Dress!! So, whether or not your baby looks like you, agrees to matching mommy and me outfits... Happy Mother's Day 2016! For me, the hallmark of a really great pattern is the fact that I want to sew it more than once... or twice...! 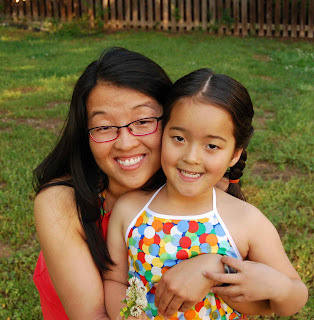 The Made for Mermaids Mama Lily and the coordinating Girl Lillian dresses are just such patterns. In fact, I sewed up the Mama Lily three times and the Girl Lillian twice during testing. 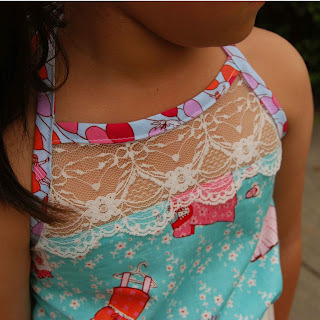 You may remember that I sewed up the original Made for Mermaids Girl Lily Lace Dress back in March 2015. The new Made for Mermaids Mama Lily Dress is meant to be the coordinating women's version- it's a little sassier, fitted for a women's body (bodice includes darts), and includes tons of options to make it perfect just for you! 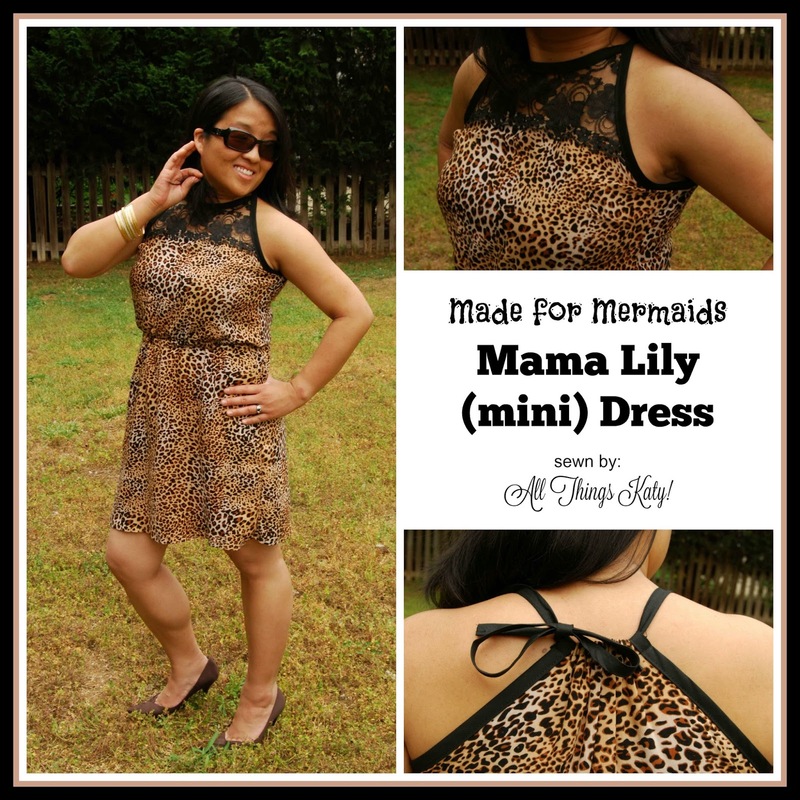 -The Made for Mermaids Mama Lily Dress can be sewn in drapey wovens or knit fabrics. -The Made for Mermaids Mama Lily Dress is sized for 30"-51" busts (sizes are color-coded- Grey through Red). Be sure to measure carefully and follow the sizing chart. Mash sizes as necessary. -The Made for Mermaids Mama Lily Dress includes four back options- full back, split back, halter with straps and halter without straps. -The Made for Mermaids Mama Lily Dress includes two romper lengths- shorts, or pants. -The Made for Mermaids Mama Lily Dress includes four dress lengths- mini, dress, maxi or puddle maxi. 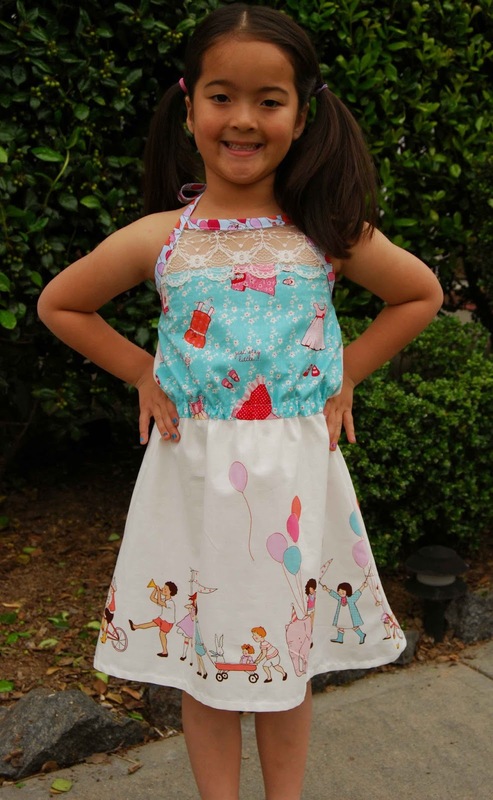 -The Made for Mermaids Mama Lily Dress includes two front bodice options- lace insert or full front. 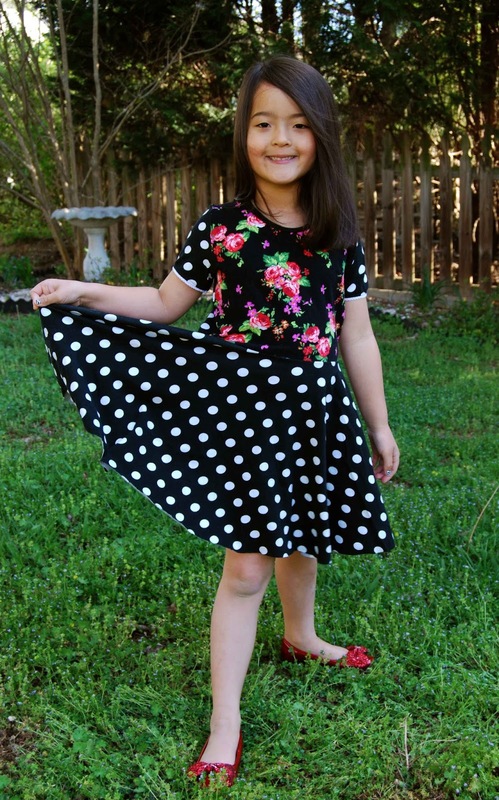 -The Made for Mermaids Mama Lily Dress PDF sewing pattern includes a sizing chart, fabric chart, elastic cutting chart and cutting layout. 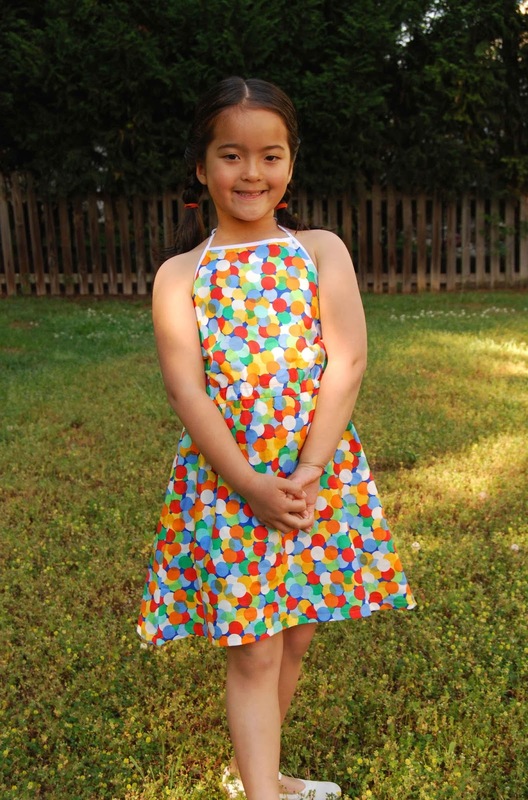 -The Made for Mermaids Mama Lily Dress PDF sewing pattern includes layered, trimless pattern pieces. That means that you can print out only the size that you need with less cutting- HUGE win in my book! 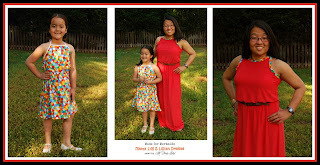 -The Made for Mermaids Mama Lily Dress PDF sewing pattern also includes tips on how to make you own bias tape and how to alter the pattern to fit you best. 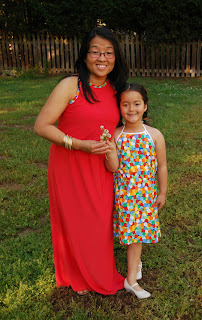 I sewed up one muslin and two nice (wearable) Made for Mermaids Mama Lily Dresses. All dresses were size purple. -Sewn in Knit ITY purchased locally. -Self-made woven bias using Michael Miller Bubble Blast. -Sewn in woven Rayon Challis, purchased locally. -1/2" off the length of the bodice ABOVE the darts. This is really important to note because before I did this, I kept getting gapping under the arm. The darts really help keep the dress from being too baggy looking. -1" off the length of the bodice BELOW the darts. The Made for Mermaids Mama Lily Dress is drafted for a 5''-5" tall woman. The typical rule of thumb is to take off/add 1/2" for every 1" you are above/below 5'-5". -I took 3" off the length of the maxi skirt. I took 1" off the length of the mini (animal print) dress. #shortgirlproblems. I've got to say, I love the Made for Mermaids Mama Lily Dress! I love that it can be dressed up or dressed down. I so appreciate the many options included in the Made for Mermaids Mama Lily Dress pattern- dress, romper, maxi- whatever your style- you're covered! 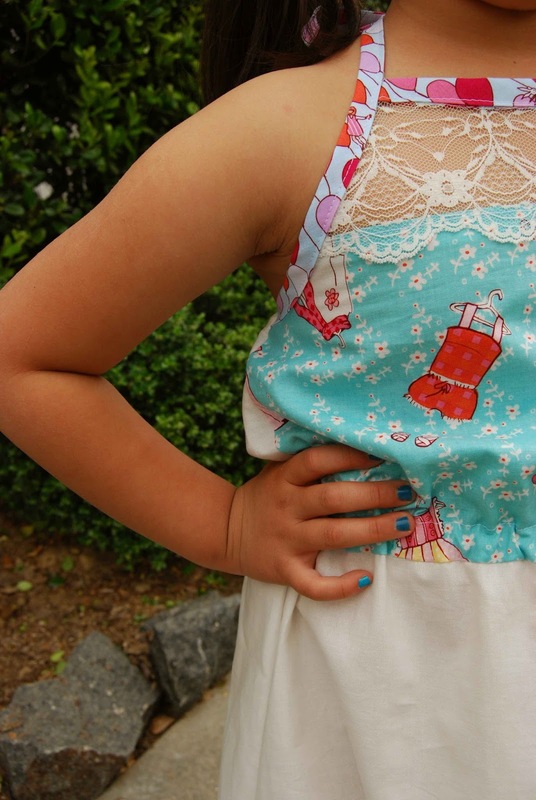 The Made for Mermaids Girl Lillian Dress is a sweet summertime dress! I love that it coordinates with either the Mama Lily or the original Lily Lace Dress. -The Made for Mermaids Girl Lillian Dress is written for either wovens or knits. -The Made for Mermaids Girl Lillian Dress is sized for 1/2-14. -The Made for Mermaids Girl Lillian Dress includes four back options- full back, split back, halter with straps and halter without straps. -The Made for Mermaids Girl Lillian Dress includes two romper lengths- shorts, or pants. -The Made for Mermaids Girl Lillian Dress includes three dress lengths- mini, dress, or maxi. -The Made for Mermaids Girl Lillian Dress includes two front bodice options- lace insert or full front. -The Made for Mermaids Girl Lillian Dresss PDF sewing pattern includes a sizing chart, fabric chart, elastic cutting chart and cutting layout. 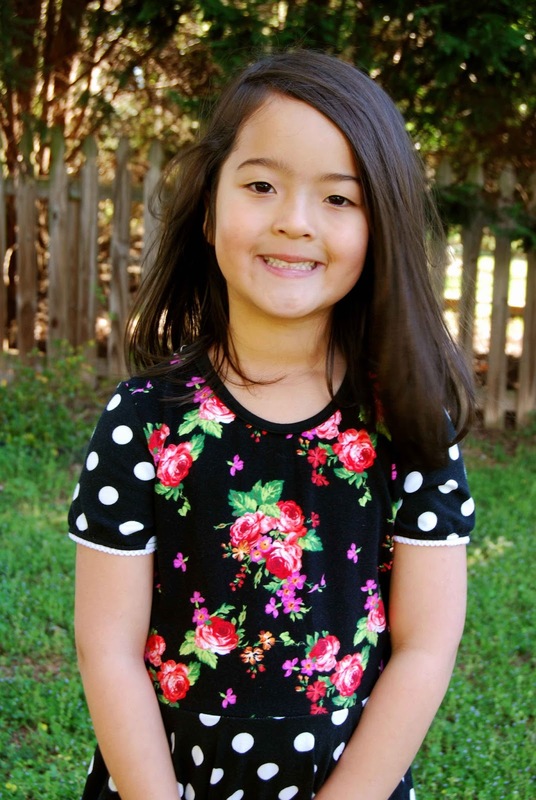 -The Made for Mermaids Girl Lillian Dress PDF sewing pattern includes layered, trimless pattern pieces. That means that you can print out only the size that you need with less cutting- HUGE win in my book! -The Made for Mermaids Girl Lillian Dress sewing pattern also includes tips on how to make you own bias tape. 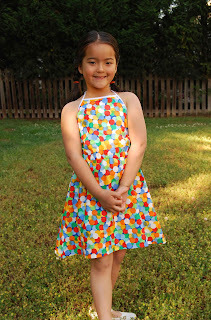 I sewed up two Made for Mermaids Girl Lillian Dress in size five width, size six length. Read the sizing chart carefully to get the best fit! -Sewn in Michael Miller's Bubble Blast cotton woven. -Used premade bias tape (super fast this way!). 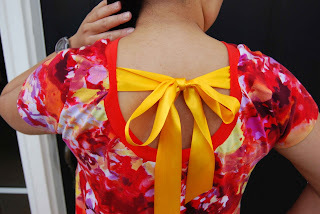 Full front bodice with pre-made bias tape. -Sewn in Michael Miller's Children at Play cotton woven. 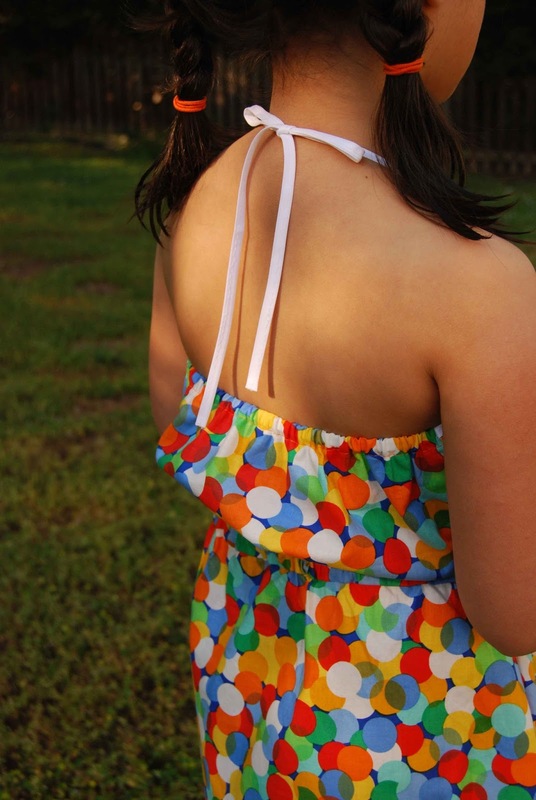 Lil' Miss LOVED having her very own "neck tie" (aka halter) dresses. 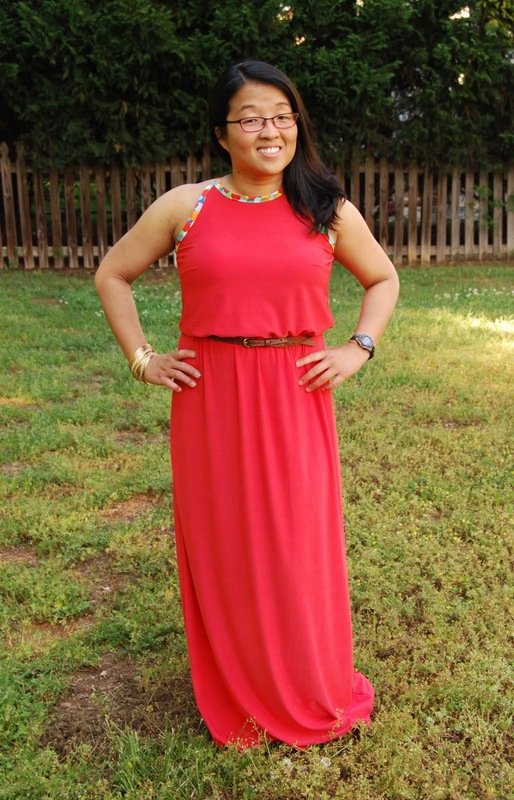 While the dresses aren't school dress code approved, they are perfect for hot summer events. Even with the halter option, the Made for Mermaids Girl Lillian Dress has great font coverage with no side gapping. Using premade bias tape made the dress super quick to sew. Also, because the dress isn't super voluminous, or doesn't include any ruffles, it's not a fabric hog. Yay! The Mama Lily will be on sale for $7 (normally $9) and the matching girls Lillian also for $7 (normally $9) OR they can get the limited time bundle for $10- ONLY through Sat midnight cst. 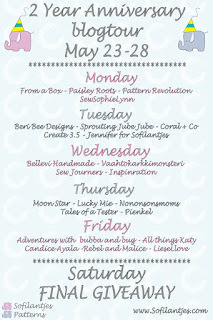 This also kicks off Made for Mermaids Romper Month- all the romper patterns will be on sale 20% off through next week. (cannot be stacked on top the release sale prices). 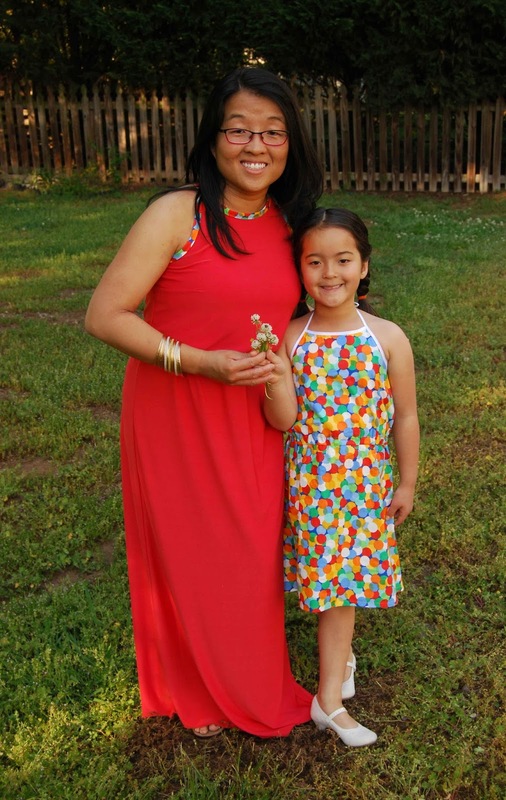 In conclusion, both the Made for Mermaids Mama Lily Dres and the Girl Lillian Dress are perfect summertime sews! Fun, stylish and versatile... I'll be sewing more, for sure!